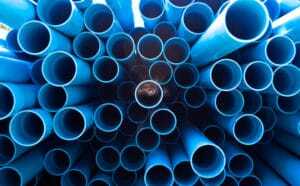 For decades, plastics have become increasingly ubiquitous within our daily lives, serving as an essential packaging material and product ingredient. But despite the years of use, and countless hours spent perfecting a plastic’s chemical makeup and manufacturing process, failure or malfunction happens—whether it be through human error or an equipment misfire on the production line. When failure occurs, manufacturers need to act quickly to uncover the cause if they want to minimize production downtime, and protect consumers and the business. 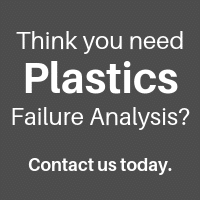 The good news is that with the right plastics analysis partner you can both proactively and reactively identify product quality issues and failure culprits. Over the years, Innovatech Labs has earned a reputation as a go-to plastics testing and plastics failure analysis lab. We partner with manufacturers like you across industries, employing a variety of testing methods to ensure the safety, durability, quality, function, and competitiveness of your products. Read on to learn how we’ve leveraged various analytical testing techniques to identify contamination or chemical composition issues that have caused product failure or quality issues. From plumbing fixtures to screwdriver handles, plastic parts are relied on for countless products. And when a part fails, determining the cause quickly is paramount. Recently, a manufacturer submitted two parts for comparison. One a “good,” functioning part, and the other a “bad” part that had fractured during use. Our team conducted a plastics failure analysis leveraging Fourier transform infrared spectroscopy (FTIR) to look for inconsistencies in the compositions of the two samples. The results? Results showed that the failed part contained significantly less dioctylphthalate (DOP), which is a common plasticizer. This meant the failed part was not structurally equal to that of the good part, and the manufacturer could make changes to the product. Thin films are a common component within a range of electronics. And in order to ensure proper function, cleanliness of every part is incredibly important. So, when one of our electronics manufacturing clients observed a haze on a polyimide film they produced they knew they needed to find the contamination source. Our team chose to perform Electron Spectroscopy for Chemical Analysis (ESCA) because of its ability to analyze thin films (e.g. <100 angstroms) on insulating substrates. Following our analysis, results showed a presence of chromium in the hazed area. This signaled that the chromium film hadn’t been completely removed during the production process. Polyethylene is the world’s most common plastic, so our team is often tapped to test polyethylene packaging materials and parts. One of our clients submitted a polyethylene part after noticing a brown-colored contaminant. They suspected that rust from a piece of steel had come into contact with the part. Once again, ESCA was our team’s technique of choice for identifying the contaminant. After completing the survey scan of the sample, we discovered iron, magnesium, silicon, sodium, nitrogen, fluorine, and oxygen were all present on the polyethylene part. The presence of iron and oxygen confirmed the possibility of rust, which caused our client to make changes to the product process to mitigate the issue going forward. Plastics analysis isn’t just for packaging materials and parts. It’s also for fully developed plastic products. One such example is the time we tested beach balls for toxins. A manufacturing company wanted to make sure a recent shipment of beach balls were free of polyvinyl chloride (PVC) and phthalates before sending them out for purchase. Turning to FTIR analysis, our analysts analyzed the ball material and the valve plug material. We found that both materials were heavily plasticized, which required removal to get accurate results. Following removal, we were able to confirm the presence of PVC. But just to be sure, we also conducted a copper flame test, which gave a positive result. From product composition issues to a misstep in the production process, determining the cause of quality issues within plastics can be done quickly through various plastics analysis techniques. 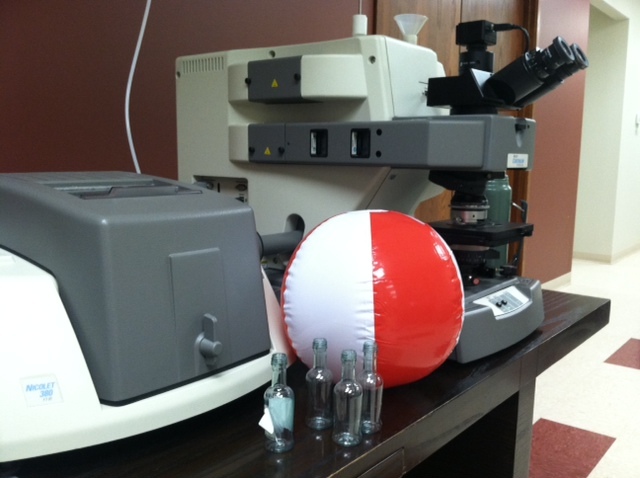 The experts at Innovatech Labs are no strangers to the world of plastics testing and analysis. Whether a product malfunctions or fails, or is impacted by a potential contaminant, we can help. Get in touch with us today for more information.